The rush of metro cities always has its own way to deal with things. The sultry weather of Chennai combined with the endless honking of vehicles during the entire day gulps your life into the never-ending cosmopolitan feel and is bound to wither your inner silence and spirituality over time. Well, don't worry! We have a rescue. Settled in the silence of Thanjavur district, lies the town of Kumbakonam. The well-settled town that has been known as a place of cultural heritage since the Sangam era, and right termed as Cambridge of South India, has a great lot to offer to your devotion and spiritual upliftment. Blend in the peace of mind by taking a road trip directly to Kumbakonam along the East Coast Road and relax your weekends. Kumbakonam experiences a typical dry climate of the tropical nature. It has pleasant weather during the cold seasons while summers are sultry and quite uncomfortable; however, they are cooler when compared to Chennai. The monsoons can be a good time, too, because it gets moderate rains with some highly erratic spells of showers, occasionally. Therefore, no matter what the season is, it is surely a perfect exit from the city on your weekends. We recommend you travel here by your favourite car in case you are coming for a family trip, and if you are a lonely soul or a group of riding junkies, then definitely discover this journey on your bike. The East Coast Road provides great picturesque and a myriad of sceneries of the Eastern Ghats, which can only be experienced though road travel. It is quite warm in Kumbakonam so no need to gear up that extra sleeve while leaving home. In case you are planning to camp or stay on the way for the night, just carry a light jacket. The distance from Chennai to Kumbakonam generally varies from 280 km to 300 km, depending on the route you take. There are three routes that can be accessed. Route 1 is about 299 km and takes about 6 hours. Route 2 is 284 km long and is popularly known as the East Coast route. We recommend the East Coast Road as it stays closer to the scenic beauty of the Eastern Ghats and you will have fresh air all around while staying away from the rush of the overwhelming traffic. As the route is short and enough scenic beauty is there along the line to treat your eyes, there are a few halts that come though. The East Coast highway is itself a joy while travelling. Luscious green vegetation on both sides flanked with hills, rivers and backwaters, there will be hardly any moment when you want to take your eyes off them. The South Indian countryside is perfect with an amazing ambience. It hosts scenic and cultural beauties and thus, is great for travelling and biking enthusiasts. The colourful and vibrant village of Chengalpattu lies 60 km from Chennai and houses the Padalathri Temple, dedicated to Lord Vishnu. There are a lot of local eateries along the way, so make sure you stuff yourself with local delicacies as much as you can. The next stop can be at Mudaliarkuppam or the Odiyur Lake, which is a popular resort hosting water sports facilities. The place is famous for migratory birds and water scooters. Kumbakonam is where you will be stopping next. The entire place is soaked in culture and bound by Kaveri and Arasalar rivers on both sides. It had been a centre of learning since the Chola times and the Britishers developed it as a proper centre of Hindu and European education. The town of Kumbakonam houses extensive paddy cultivation making the greenery more prominent with a slow breeze of fresh air flowing through the tall coconut and deltaic trees. The place is well known as a true quest for spiritual insight. 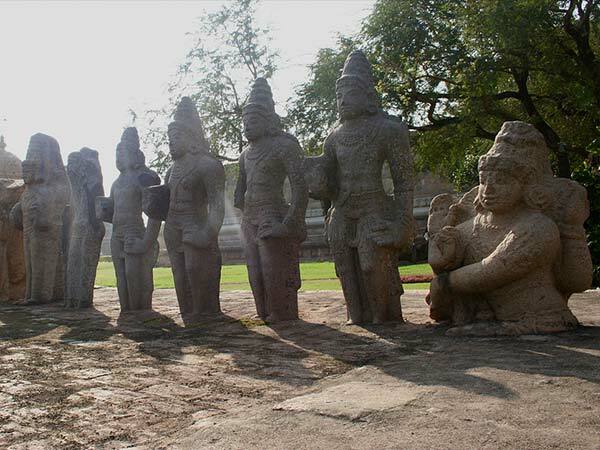 With innumerable temples located in its proximity, you have many options to visit them. To start with, do not miss a visit to the Airavatesvara Temple, which is a UNESCO World Heritage Site. The temple is a glimpse of the magnificent Chola architecture. The beautifully carved stone pillars that depict the Vedic and Puranic deities are combined with the magnificent reflections in the grandeur of the Vijayanagar and Chola empires. The Adi Kumbeswarar Temple is known for its multiple gopurams or gateways; however, the temple opens after 4 pm. The Sarangapani Temple is a well-known Vishnu temple of Kumbakonam and houses the principal deity with his consort, Lakshmi. The other temples that you might not want to miss out are Uppiliappan Temple, the Patteeswaram Temple, the Nageshwara Temple, to name a few. The Mahamaham Tank is largest temple tank of Tamil Nadu. There are 21 spring wells and 8 other wells named after principle Hindu deities. This site hosts the famous Kumbh Mela. This Vishnu temple holds the key to superior elevation of inner self. The granite walls of the temple surround the principle shrine, which shows Vishnu appearing in the form of a chakra with eight arms. Kumbakonam also hosts a lot of cafes, eateries and local hotels that serve delicious South Indian delicacies. Do not forget to try out the Kumbakonam kadappa, which a vegetarian delight made of various spices served with idli and dosas. The well-known Chola and Vijayanagara architecture flows through the entire place. It is a calm and relaxing journey that will bind your relations with spirituality in a deeper sense and rejuvenate you from within. Gear up for this memorable journey to make it a perfect weekend.